A few weeks ago, the night we made the rotisserie rabbit, some friends we’d invited gave us a sack of vegetables fresh from their garden. 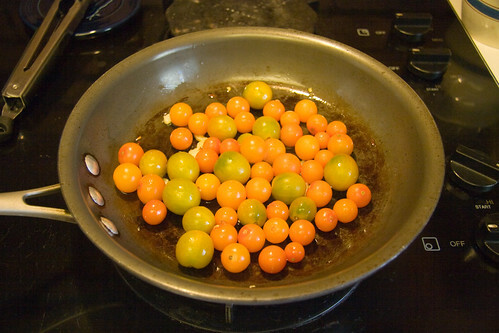 Along with some tasty peppers, there was a basket full of bright orange-red cherry tomatoes. For much of my childhood, my mother maintained a hearty vegetable garden, complete with many tomato varieties, both large and small. 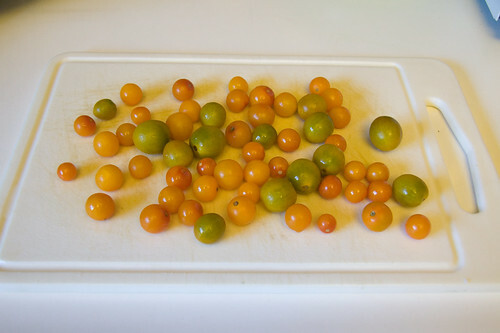 I would often eat whole tomatoes right off the vine—like apples—a pleasure that is hard to duplicate with most grocery tomatoes, which made me all the more delighted to receive such ripe gifts from our friends’ yard. Truth be told, I would have been happy to eat the tomatoes one by one right out of the bag, but I set some rules for myself, one of which was that all foods needed to be prepared in some way. Torn between a desire to do as little as needed and a deep respect for the rules, I whipped up a simple side of sautÃ©ed tomatoes with garlic, crushed red pepper and salt. 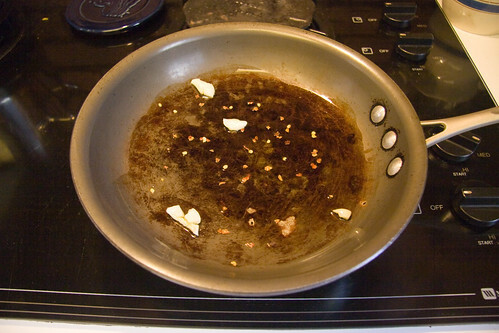 I crushed a couple cloves of garlic and put them in a pan of olive oil with the red pepper flakes. After a few minutes, I added the tomatoes and tossed them continuously until the skin just began to split. 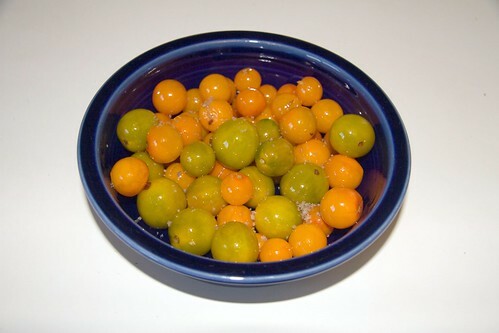 Finally, I dumped the tomatoes in a bowl and sprinkled them with salt for a quick, bright summer side dish.